if an artist did it. I keep hearing more and more about how we're all killing ourselves slowly by sitting eight hours a day. You can read one anti-sitting article here. I'd prefer my tombstone not to say "Died from an overdose of sitting," so some time ago I purchased a BJÖRKUDDEN table from Ikea. At 40 and 1/8 inches, it is probably their tallest table. It isn't the perfect height for me, but it works. I put my MacBook Air on a shoebox to get the display a tad higher, but I'd ideally like to get an adjustable arm to raise my laptop even closer to eye height. 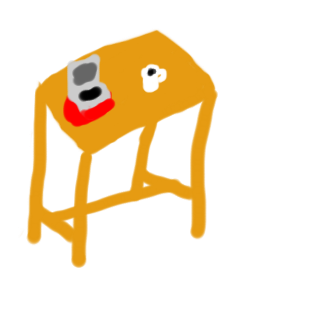 Does anyone else have a suggestion for an economical standing desk hack? What other improvements can I add to the system? I build iOS apps, and help iOS developers with their careers and finding jobs. I helped build the Prevent Biometrics, Evernote, Scannable, Skitch, HomeAway, and many other apps. I love writing about the hidden worlds of wealth and investing. Getting rich looks hard, but the basic principles are simple. Save 10% to 30% of your income. Invest it wisely. I'm the author of Conquering Your Engineering Internship, a manual for engineering students looking to enjoy an awesome co-op or internship and get a great start to their career. I also wrote A Developer's Guide to Job Offers. Finally, I'm an amateur windsurfer and photographer. Learn the business side of mobile apps, start with these essays on the business of mobile apps. Improve your life as a Software Developer or Engineer. Get started with these top career posts.